Supporters, dignitaries and guests joined Narconon staff to celebrate the opening of the new Narconon United Kingdom Drug Rehabilitation and Continental Training Centre at its nine-acre facility on the outskirts of the village of Maynards Green. To the cheers of hundreds of supporters gathered at its East Sussex site, the ribbon was cut on the new Continental Narconon drug rehabilitation centre. 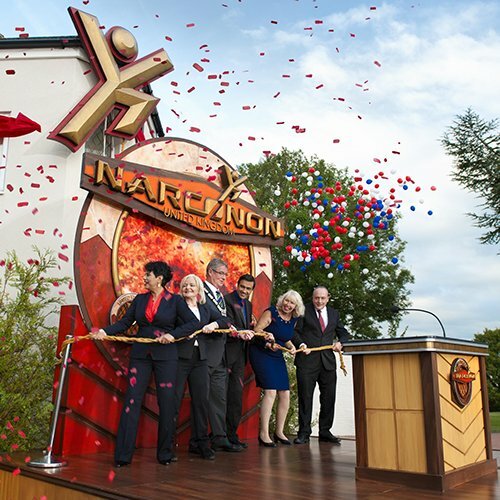 Dignitaries from across Southern England joined Narconon executives for the ribbon-cutting ceremony for the new model Narconon for the UK. signaling the beginning of a new era of drug-free drug rehabilitation in the United Kingdom. the new centre to see the facilities it offers and learn more about the programme. Narconon UK welcomes students and staff-in-training from throughout the United Kingdom. The new Continental Narconon for the United Kingdom stands on a country estate in East Sussex to serve as a model drug rehab centre and to train and apprentice staff for future Narconon centres across England, Scotland, Ireland and Wales. The New Life Detoxification Centre enables students to fully recover from drug addiction, through a precise regimen of exercise, sauna and nutrition that rids the body of residual drugs and toxins. The New Life Detoxification Centre features every element to provide exercise, sauna, proper nutrition and rest through this phase of the Narconon programme. This course room accommodates students on an array of Life Skills Courses that lead to stability, self-respect and the return of personal values, providing the individual the tools to remain drug-free. The exceptional quality of the Narconon programme is reflected throughout the facility. This combination of comfort and effective rehabilitation technology offers the perfect environment for long-term success. Every care has been taken to provide a calm and aesthetic space where the student can recover without distractions of any kind. At Narconon UK, every amenity is designed with complete and successful rehabilitation in mind. Situated on the outskirts of Maynards Green, East Sussex, the Narconon Centre for the United Kingdom spans nine acres of rolling downs—an environment perfectly suited for a model drug rehabilitation centre. The four-building Narconon United Kingdom serves as the model centre for extending drug rehabilitation services across England, Scotland, Wales and Ireland. To the cheers of hundreds of supporters gathered at its East Sussex site, the ribbon was cut Saturday, September 5, on a model Narconon drug rehabilitation centre in the United Kingdom. The facility promises to provide a highly effective setting to help individuals free themselves from the grip of addiction and at the same time train Narconon staff from throughout the UK. Supporters, dignitaries and guests joined Narconon staff to celebrate the opening of the new Narconon United Kingdom Rehabilitation and Continental Training Centre at its nine-acre facility on the outskirts of the village of Maynards Green. The renowned Narconon drug-free rehab methods, based on the researches and writings of Scientology Founder L. Ron Hubbard, will be delivered in a distraction-free environment on nearly nine pastoral acres near the village of Maynards Green. It opens during an exciting time of expansion for the Narconon network around the world. The timing of this Narconon centre’s launch is especially fortuitous during a time when the drug addiction problem is so urgent and acute in the UK. Also addressing the guests at the Narconon opening was Dr. Basant K. Puri, medical professor at Hammersmith Hospital and Imperial College London, who heads the Lipid Neuroscience Group in the Imaging Sciences Department of the Faculty of Medicine. Dr. Puri expressed high praise for Narconon’s drug-free approach to addiction rehab. The final speaker was Ms. Diana Coad of the National Drug Prevention Council. “I can truly say that the Narconon success rate is second to none,” she emphasized. “I have seen so many people leave alcohol and drug treatment programmes and, through the revolving door, go right back to their original life of drug abuse. But the vast majority of Narconon graduates go on to live stable, ethical, productive, drug-free lives year after year. For nearly 50 years, the Narconon programme has saved the lives of countless individuals who were thought lost to substance abuse forever. Its mission is to provide an effective path for drug abuse rehabilitation and to assist society in reversing the scourge of abuse worldwide. Narconon addresses those in the programme as “students” rather than “addicts” or “victims,” and its sole purpose is to provide people with the tools to lead successful drug-free lives. Every detail is considered to give students the stability and comfort they need to help free them from addiction and rebuild their lives without drugs. The Narconon programme begins with a drug-free, nonmedical withdrawal process designed to assist the individual in shedding a dependence on drugs as rapidly and comfortably as possible. It is followed by a distinctive method of detoxification, specifically geared to help drug users eliminate the residues in the body that drive cravings, while at the same time supporting the body with supplements. The final component of the programme is a series of Life Skills Courses that furnish students the tools needed to remain drug-free throughout their lifetime. Harnessing the power of audiovisual tools to bypass literacy barriers and increase understanding, 23 instructional films in 29 dialects and languages have been created for the various parts of the Narconon programme. The opening of the new state-of-the-art Narconon centre in the UK was made possible by generous contributions from members of the International Association of Scientologists. It is the second of a series of model Narconons opening over the coming weeks. Also on September 5, the Continental Narconon Europe was dedicated in the countryside of Denmark. Narconon Latin America in Mexico—serving the 21 nations of Latin America—opens next, followed by a Narconon facility atop the mountains in Ojai, California, specifically dedicated to providing drug rehabilitation services to artists and leaders in society. Narconon centres operate today in some 23 countries on six continents. For more information, visit narconon.org.